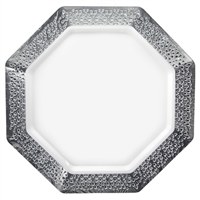 Silver 7" x 5 5/8" rectangular plate. 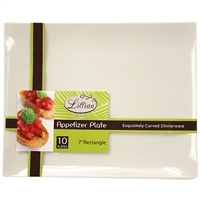 BPA Free, Plate is slightly curved at the edges and is typically used for serving appetizers. Gold 7" x 5 5/8" rectangular plate. 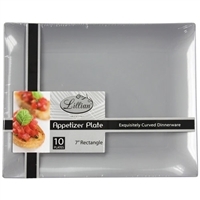 BPA Free, Plate is slightly curved at the edges and is typically used for serving appetizers. 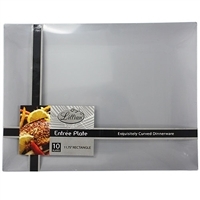 White 7" x 5 5/8" rectangular plate. 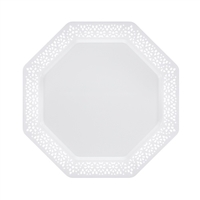 Plate is slightly curved at the edges and is typically used for serving appetizers. 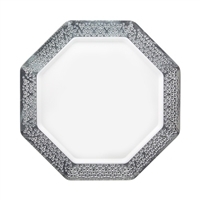 White plate with silver trimming. Plate has a 7.25" diameter. Food safe, BPA free plastic. Comes in packs of 10. 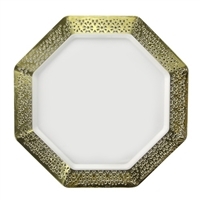 White plate with gold trimming. Plate has a 7.25" diameter. Food safe, BPA free plastic. Comes in packs of 10. 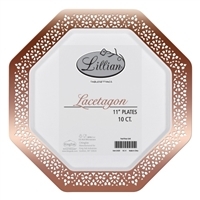 White plate with rose gold trimming. Plate has a 7.25" diameter. Food safe, BPA free plastic. Comes in packs of 10. White plate with white trimming. Plate has a 7.25" diameter. Food safe, BPA free plastic. Comes in packs of 10. 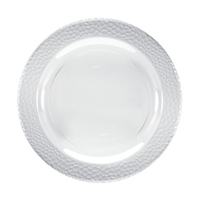 White 14" plates with textured rim. Food safe, BPA free plastic. Plates come in packs of ten. Clear 9" plates with textured rim. Food safe, BPA free plastic. Plates come in packs of ten. 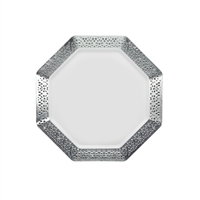 Silver 9" x 6 7/8" rectangular salad plate. 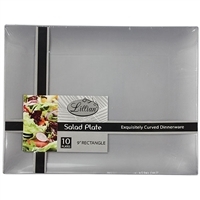 BPA Free, Plate is slightly curved at the edges and is typically used for serving salad. 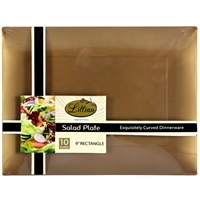 Gold 9" x 6 7/8" rectangular salad plate. 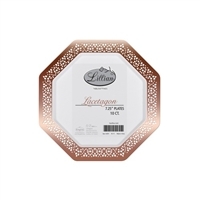 BPA Free, Plate is slightly curved at the edges and is typically used for serving salad. 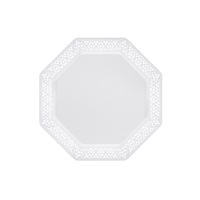 White 9" x 6 7/8" rectangular salad plate. 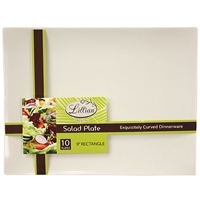 BPA Free, Plate is slightly curved at the edges and is typically used for serving salad. White 9.25" plate with silver trimming. Plates are 9.25" in diameter. Food safe, BPA free plastic. Comes in packs of ten. White 9.25" plate with gold trimming. Plates are 9.25" in diameter. Food safe, BPA free plastic. Comes in packs of ten. White 9.25" plate with rose gold trimming. Plates are 9.25" in diameter. Food safe, BPA free plastic. Comes in packs of ten. White 9.25" plate with white trimming. Plates are 9.25" in diameter. Food safe, BPA free plastic. Comes in packs of ten. White plate with silver trimming. Plate has a diameter of 11". Food safe, BPA free plastic. Comes in packs of ten. 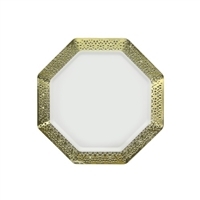 White plate with gold trimming. Plate has a diameter of 11". Food safe, BPA free plastic. Comes in packs of ten. White plate with rose gold trimming. Plate has a diameter of 11". Food safe, BPA free plastic. Comes in packs of ten. White plate with white trimming. Plate has a diameter of 11". Food safe, BPA free plastic. Comes in packs of ten. 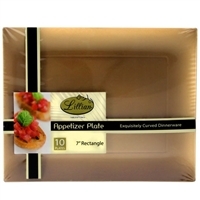 Silver 11 3/4" x 9" rectangular plate, BPA Free, Plate is slightly curved and is typically used for serving entrées. 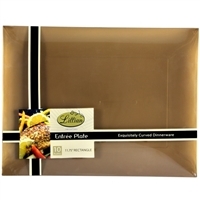 Gold 11 3/4" x 9" rectangular plate, BPA Free,Plate is slightly curved and is typically used for serving entrées. 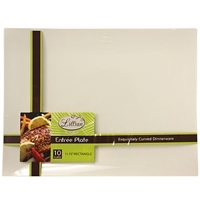 White 11 3/4" x 9" rectangular plate, BPA Free, Plate is slightly curved and is typically used for serving entrées.